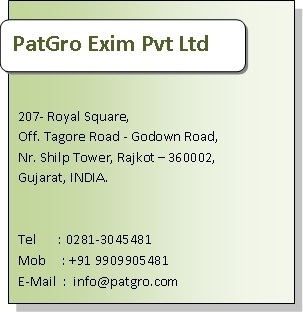 PATGRO EXIM PVT. 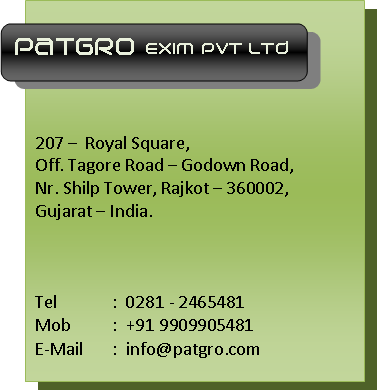 LTD. is one of the prominent agro commodity exporters in India. The company is exporting agro commodities to customers across the globe. High quality products, availability of wide variety, and timely delivery are some of the attributes of our company. PATGRO’s presence is felt on a daily basis. Through the sesame seeds on your Backery Products, to the peanut butter in your sandwich, to the spices in your daily cooking ,we indirectly impact the lives of thousands. This vital responsibility compels us to embrace integrity, ethics, and value in all that we do. 207 - Royal Square, Off. Tagore Road - Godown Road, Nr. Shilp Tower, Rajkot - 360002, Gujarat - India.